"Warhol and Koons are brilliant specialists in the art of circulation, cultivators of figures and forms that sprout and multiply within the collective psyche. Like wildflowers, their artworks take root in the meadows of the mind where they flutter and cross-pollinate, simultaneously defenseless and ineradicable. Warhol's silk-screens of flowers from 1964 somehow caught that era in a single snapshot--its mass-mediated banalities, hallucinogenic excesses, and atomic anxieties...Warhol could be seen as the art world's postmodern Proust. Like the long-suffering novelist, he had a fascination with the minutiae of society--as recounted in his diaries--and a compulsion to portray its leading lights. Where Proust had an obsession with detail, Warhol was fascinated by surface. 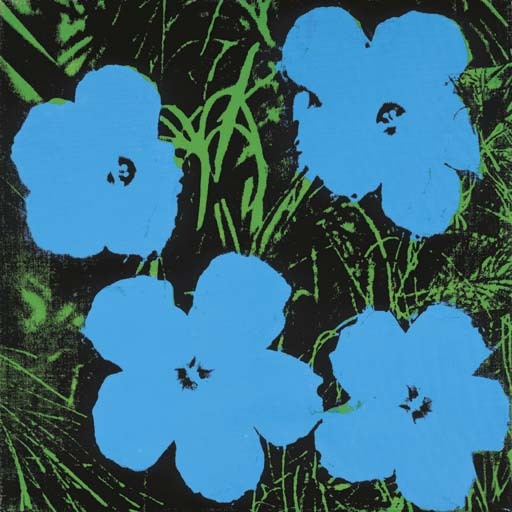 Where Proust was a memory machine, Warhol was a perfect blank slate for displaying the preoccupations of time" (D. Pinchbeck, Jeff Koons, Andy Warhol: Flowers, New York, 2003, pp. 1, 3-4).